There is a brand new tattoo removal laser on the market. Actually it’s not even available yet BUT the manufacturer has a rep in town demonstrating the unit. They are coming to Fade Fast this next Tuesday, March 4th, and I’m looking for 1 or 2 people to come in for a session. I realize many people that read this blog don’t live in Dallas so please pass the word. Oh, the session will be free AND all future sessions on the same tattoo will be free as well. Her cell phone is ringing, but the display is turned off. She lightly pushes a small dot on the skin on her left forearm to suddenly reveal a two by four inch tattoo with the image of the cell phone’s digital display, directly in the skin of her arm. She answers the call by pushing a tattooed button on her arm. While she’s talking, the tattoo comes to life as a digital video of the caller. When she finishes, the tattoo disappears. This Bluetooth device is permanently implanted beneath the skin. It is flat, flexible, silicon and silicone. Tightly rolled when it’s inserted through a small incision, and then unfurled beneath the skin, it lies benignly between skin and muscle. Through the same incision, two small tubes are attached from the implanted device to an artery and a vein. A coin sized blood fuel cell in the implant converts the blood’s glucose and oxygen from the artery to the electricity required to power the device. Used blood returns through to the vein. The digital device’s power source is the same as for all of the biological components in the body. The surface of the implant that faces the underside of the skin is covered with a matrix of field producing pixels that activate a matching matrix of pixels tattooed onto the surface of the skin above the implant. The field penetrates the skin to drive the tattooed display, while the skin continues to provide its function of sealing the body from the world. The surface of the implant is also a touch screen control, pressed through the skin. Rather than ink, tiny clusters of microscopic spheres are injected, like tattoo ink, into the skin. Each sphere is filled with a field sensitive material that changes from clear to black when a field in the matrix is turned on. John if you read this, please send a link to you site, blog, email. I would love to here more about this idea. Click for larger image – Caleb – 2 laser treatments. Click for larger image – 2 laser treatments. I snapped a couple of really nice photos this evening. The first image is a simple composite showing the difference between treatments. 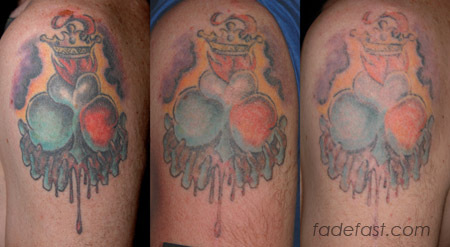 The second image shows a really nice contrast between the tattoo and an existing piece. The tattoo above has been treated 3 times. Fade Fast has officially made a permanent move from part time Hold Fast / part time Suffer City to full time Suffer City. Why the move? Honestly, Hold Fast just doesn’t have the room any more. AND just to answer everyone’s questions…(yes I have been asked twice now)…do I still recommend that artists at Hold Fast? The answer is a resounding YES! As with my former shop, Obscurities, the artists at Hold Fast are top notch. Plus, the vibe in their is great. On my days off, I still hang out in Hold Fast. What can I say? I love those guys! My Tattoo Itches…What do I do? It’s a common question and, as you guessed it, the answer is DON’T SCRATCH. But is that really helpful? No, of course not. Not to worry, there are several things that can be done about itching but first it’s best to determine the cause. In most cases, itching is directly related to a histamine response that happens during the healing of the dermis, the level of the skin where the tattoo ink resides. In which case, an oral or topical antihistamine will help considerably with the itching. If the skin is blistered or scabbing, a topical antihistamine should be avoided and the issue may be more than just a histamine response. At this point, the area should be washed thoroughly with an antibacterial soap, dried with a paper towel (cloth towels often have bacteria on them), a triple antibiotic ointment applied to the area and the wound dressed with a new bandage. This should dramatically decrease the itching and eliminate most of the bacteria on the wound. In the final stages of healing the skin is often dry and flakey. Yes, an antihistamine would still help. However, the itching is most likely caused by the dry skin. Applying a perfume free lotion will dramatically reduce the sensation and help from tearing the skin.